So, Lies Ripped Open came out just over a month ago, and I thought it would be nice to see how it’s done. I’ve got to say, I’m more than a little astonished by how well it’s done. And review wise it’s been great too. I’m not going to make any bones about what a huge fan of this series I am, most people know it anyway, but just to be clear I am a HUGE fan of this series. With Lies Ripped Open the addictive quality of the Hellequin Chronicles goes into overdrive – I read this, fast and furious into the early hours of this morning so Steve McHugh definitely owes me a coffee or six – but you kind of just have to keep going once you start. The backstory is fleshed out in this instalment, giving some insight into past events and also setting us up for more to come – Nate is on top form here and the magical mythology that the author has created using his own obviously insane imagination and mixing it up with stories we all know has also taken a huge jump in depth and creativity. 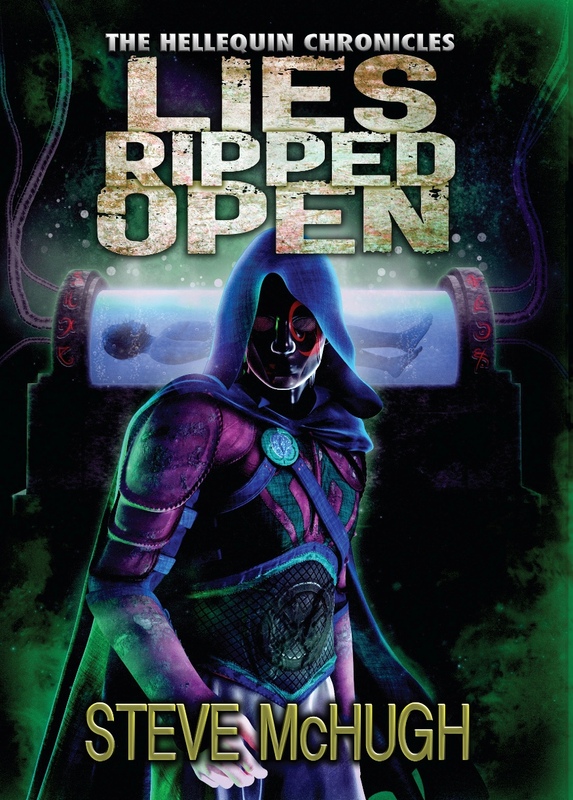 This is quite firmly in the adult market – Urban Fantasy for those of us who like our stories uncompromisingly realistic despite the mythological backdrop, Lies Ripped Open was a purely joyful read that I was more than happy to lose sleep over. The dialogue is witty and full of ironic clarity, I love all the characters and each new novel brings something a little different than the last, the ongoing storyline is really well constructed – for that reason I would recommend reading these in order, although you CAN jump in at any point and have an excellent time. Brilliant. The only problem being of course is now the wait starts for book 6. Which after THAT ending you will kind of wish you had sat there already. Taps foot. This fifth book in the Hellequin series moves the main, overarching plot forward quite a bit. There are a number of significant developments that take place along the way, and several major situations change in a no-turning-back sort of way. As is typical with this series, the book was riveting from start to end and left me wanting more, yet was also very satisfying at multiple points along the way. So, all in all, it’s been a wonderful month. But I know people want to be told what’s happening next. Well unfortunately I can’t tell you that yet, I should be able to soon enough, but for now that’s going to have to stay under wraps. I can tell you that Book 6 is being written, and that the Flashbacks are set in 1195 in the Kingdom of Jerusalem, but that’s it. Thank you to everyone who grabbed a copy to read or listen to, it’s been wonderful hearing how much people have enjoyed it. Here’s to many more to come. Well now that the launch for Prison of Hope has finished and the book has been almost universally enjoyed, it’s time to look forward to August’s Launch of Lies Ripped Open. There’s no cover yet, but there is a blurb. Which is below. You can pre-order the book by clicking the links below.